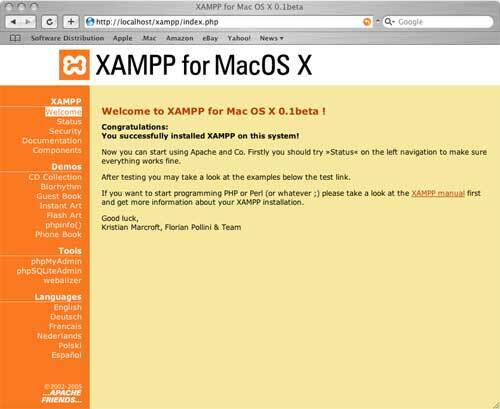 XAMPP for Mac is an easy to install Apache distribution containing MySQL, PHP and Perl. XAMPP is really very easy to install and to use - just download, extract and start. XAMPP for Mac OS X is the simplest, most practical and most complete webserver solution for Mac OS X. XAMPP for Mac contains: Apache, MySQL, PHP & PEAR, SQLite, Perl, ProFTPD, phpMyAdmin, OpenSSL, GD, Freetype2, libjpeg, libpng, zlib, Ming, Webalizer, mod_perl. ...... XAMPP for Mac you only need to download and extract XAMPP, that's all. There are no changes to the Windows registry (not true if you use the Windows installer version of XAMPP) and it's not necessary to edit any configuration files. It couldn't be easier! Qweas is providing links to XAMPP for Mac 1.7.3 as a courtesy, and makes no representations regarding XAMPP for Mac or any other applications or any information related thereto. Any questions, complaints or claims regarding this application XAMPP for Mac 1.7.3 must be directed to the appropriate software vendor. You may click the publisher link of XAMPP for Mac on the top of this page to get more details about the vendor.